Please note: this article is an English version of the original article written by Helena Dvorakova for Pravda newspaper, translated and reproduced here with the Chief Editor’s permission. Click here to view the original. Michal Sirik is from eastern Slovakia, just like the family of Andy Warhol. They were peers – one, however, was an avantgarde artist in the USA, the other painted naive art at home. Sirik, too, exhibited in the Warhol’s Museum in Medzilaborce, and his paintings are in many galleries and collections, like the one in the Holocaust Memorial Museum in Washington, DC. 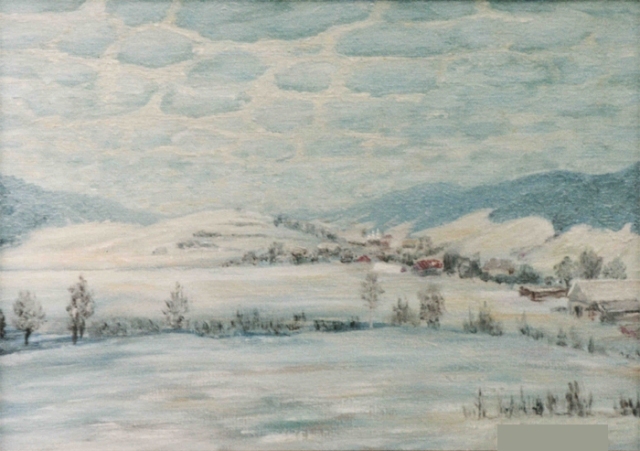 Michal Sirik was born in 1925 in Sterkovce that is now a part of Čabalovce near Medzilaborce. His family was poor, and so he was expected to help out from an early age. He took care of the cattle, worked in the field, accompanied the lumberjacks and assisted them in making lump charcoal. This now rare craft used to be wide-spread back then. The lumberjacks who “burnt” the lump charcoal in the forests were called “miliari” in Slovakian. Based on these memories, in 1987 Sirik created a set of six oil paintings titled Miliari. They capture not only the process of making the lump charcoal, but also the interesting and demanding life style these lumberjacks led, often spending winters in the forest, and working at the lowest temperatures. On the turn of the 20th century, charcoal burning was a regular source of supplementary income for people in eastern Slovakia. Young boys were apprenticed at 14. “Miliari” lived in cottages in beech or oak forests, and every day they felled and sawed trees, and tightly layered the logs into a tall spire. They covered it with leaves and soil and set on fire on the inside. The logs burned slowly, changing into charcoal within twelve days. The fire had to be kept day and night, and in any weather. When the charcoal was ready, they filled the sacks and took them in wagons to Sterkovce and Medzilaborce, from where they were transported by train to towns further away. The blacksmiths in that region used exclusively lump charcoal made by “miliari.” Michal Sirik captured it all, and according to Rusyn ethnologists Nadezda and Jozef Varchol, these six oil paintings are among the most valuable and captivating artworks of his. It is only natural that work is a common subject of Sirik’s paintings. It was his world, the world he knew, and so he documented it. He convincingly portrayed many themes from the Rusyn life that was not always easy. Some titles give us a clue as to the subject matter: Wheat Harvest, Hauling Grain, Threshing, Making Sauerkraut, Hazelnut Harvest, Hauling Trees, Slaughter. He painted not only scenes, but procedures, too. He showed how people used to process crops and wild berries, what crafts they relied on, how they lived. Sirik painted many typical village customs and practices – from kitchens and backyards of the Rusyn people; practices that faded away with time. He showed people weaving, grinding flour in millstones, baking bread, plucking geese. The ethnologists Varchols are convinced that this part of Sirik’s art has an immense value as a historical documentary – he often depicted religious events and customs of the Rusyns, their holidays, rituals, weddings, newborns, Christmas and Easter. 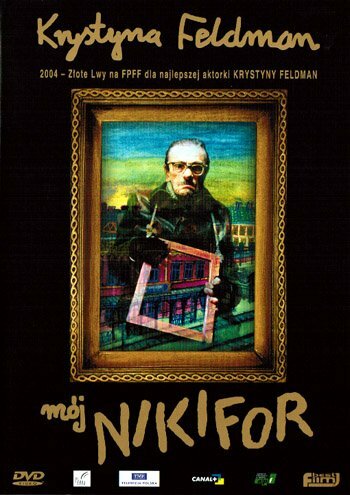 Michal Sirik was a carpenter by occupation, but when he retired in the 1980s, he committed himself only to painting. The dates on his artworks are therefore fairly recent (he passed away in 2012), but their subject matter is from the old world, the world that is no more. Sirik had a phenomenal memory and was a great storyteller, so he was able to paint from memory with great precision. The ethnologists are in awe at his ability to vividly capture such long-forgotten moments as, for example, girls’ Easter games. He was also interested in architecture and landscape. The monastery in Krasny Brod has a special place in his work. They used to hold famous fairs near the monastery. A legend has it that during these events young men would pick brides there. Young girls would line up and the men would look for their one and only, chanting: “Come to see a priest if you need a husband!” Later, a basilian monastery was erected on that spot, yet Sirik painted the ruins of the original building from the 14th century. The new monastery building that stands there now is from the 1990s, and, of course, young men don’t pick their brides there anymore. The problem was that these couples could go from the fair straight to the priest and get married right away, without the consent of their families, which would then fall out. This was the reason these fairs were banned in 1720. Sirik did not paint contemporary themes too often, but there are some paintings that show, for example, rebuilding a local road that crosses a beautiful landscape, and Medzilaborce – a square with pedestrians and a busy traffic. His characteristic works are paintings of abodes. They are welcoming and pleasing to the eye because they contain many characters and stories; and they are composed with a strange order and peace that is rather rare today. They feel almost therapeutic. The paintings of the life of the Jewish people in eastern Slovakia form a special chapter in Sirik’s work. Before the Second World War, the Jews were numerous and well-established around Medzilaborce and Humenne, and they actively participated in the economical and social life of the region. Sirik painted street scenes full of small shops and pubs owned by the Jews. An oil painting from 1997 titled A Selling Jew captures a market with villagers and townspeople. Sirik also masterfully painted a Jewish wedding and the synagogue on the Rybne Square in Bratislava and the Staronova synagogue in Prague. Whereas the pre-war period was depicted peacefully, Sirik added a lot of drama in his works on holocaust. The canvases from 1991 titled Deportations of the Jews convey the tragedy of this experience. The critics agree that naive artists usually do not deal with holocaust, which only adds urgency to Sirik’s message. A newly published book about the artist was compiled by a team of authors – Katarina Cierna, a curator of the naive art in the Slovak National Gallery, the ethnologists Jozef Varchol, Nadezda Varcholova and Maria Miskova, a critic of Sirik’s work in the Museum of Humenne. It was delightful that the book was “baptized” in a very original way – they pulled it out from a pile of hazelnuts! Maria Miskova compared Sirik’s work to these fruits: only when they ripen, they fall on the ground, and when we crack them, we feel their sweet taste. This is the case with Sirik’s work that was cracked open and went out to the world. The book contains 85 reproductions accompanied by texts in Slovak, Rusyn and English. The graphic design was done by Stanislav Stankoczy, the Dean at the University of Visual Arts in Bratislava, who also comes from eastern Slovakia. And one more good news – the Gallery of Naive Art at the Slovak National Gallery held an exhibition of Sirik’s work in Pezinok in summer 2016 where the book was introduced, too. 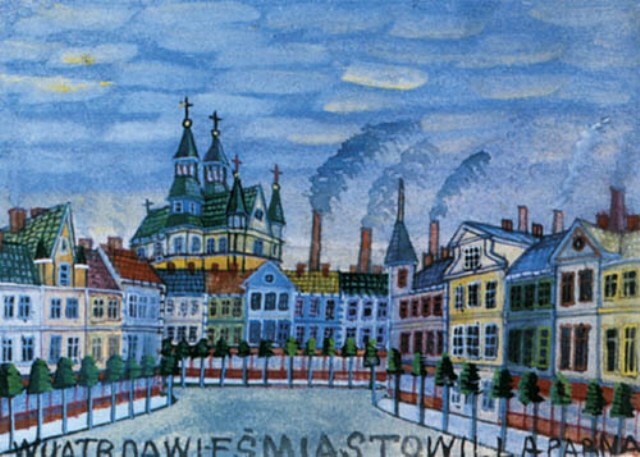 By now, we know about naive art thanks to Miroslav Potoma, Stefan Telep, Teodor Kuziak and Nikifor. 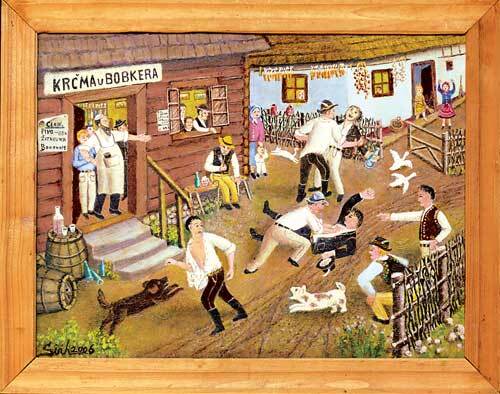 They all have their own signature when it comes to capturing the scenes connected to the everyday Rusyn life. So when you hear “Nikifor,” you should see the many views of Krynica, when you hear “Potoma,” the magic of the Rusyn past crosses your mind, and when you hear “Kuziak,” you recall the colorful Lemko villages. So what do you see when you hear “Sirik”? Sirik’s paintings are highly praised, his work has received many awards. He started painting only when he retired in 1983 at the age of 58. Since then he entered into public and private collections of such collectors as John Warhola (Andy’s brother) or Peter Breiner (a famous pianist from Humenne, Slovakia living and working in New York) and he exhibited in all the important naive art exhibitions in Europe (1). What is mostly noticed about his compositions is the high number of figures, lots of colors, and the stories that are behind every grouping that carry the meaning of the scene. 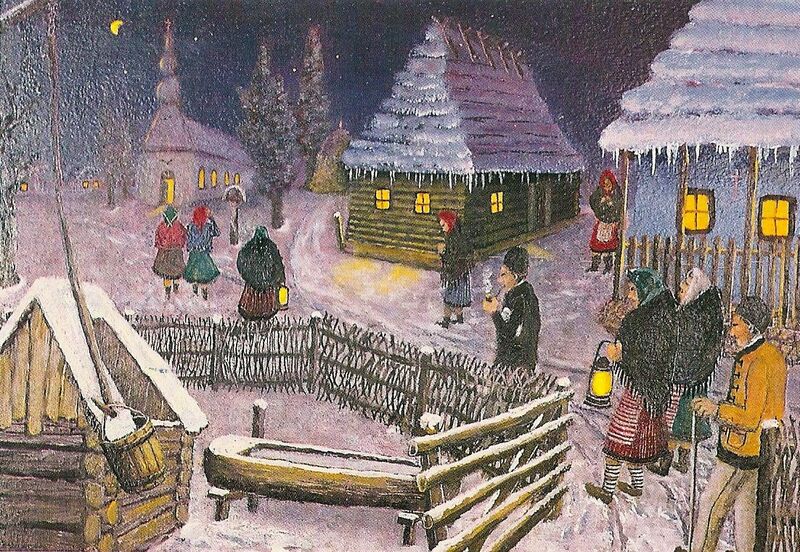 You get some amusement from observing the everyday life in the paintings, but you also get a sense of solemnity, as, for example, in the painting above, where the Christmas mood in the village is so beautifully captured. You’re probably curious what it means. Well, it’s a personal impression, really. To me, if you’ve seen a war, you’ve seen it all. During WW II, Kuziak dug trenches, built bunkers and eventually fought in the VI Guard Division of the III Ukrainian Front that joined Red Army in drawing the Nazis out. In 1947 (during Operation Wisla) he was one of the 200,000 non-Polish minority civilians forcefully relocated from southeastern Poland where he lost two uncles to death camps. Kuziak is a Lemko artist classified within the Rusyn naïve art, together with Stefan Telep, Nikifor, Miroslav Potoma and Michal Sirik. As it is with the rest of the group, Kuziak, too, put his own twist on capturing his native lands and celebrating everyday moments in the Lemko village where he himself was a farmer. One can discern certain tension in his paintings, developed especially through a slightly rigid rendering of the characters’ facial expressions, and through a sharper line. Again, this is a stylistic choice that makes you aware of the underlying realness of the scene, and not the fairy-tale-like depiction of the village life, because both strain and relief are present. I already talked about what became my first encounter with naive art – Miro Potoma from Slovakia. Through getting to know his work and exhibitions, and through exchanging some insights with Rich Custer, I came across Stefan Telep from Poland. I found it telling that he would put the words “unprofessional painter” on his online portfolio. He exhibited with Potoma in Svidnik, Slovakia, a year ago, and I can only imagine how memorable it must have been to see and compare the two naive Rusyn artists side by side in a joint show. I am pointing out one of his winter landscapes because I haven’t posted any winter paintings yet, and also because we all know how hard it is to paint…well, snow.